Dwoskin’s career initially began in graphic art, studying at New York University under influential artists Joseph Albers and Professor Willem de Kooning. He went on to work as an acclaimed graphic designer and art director for CBS and Epic Records. He made a point of not distinguishing between types of art, however, and alongside his work in design, he discovered a passion for experimental cinema inspired by Maya Deren’s films and the transgressive underground works of Jack Smith and Ron Rice which would last him a lifetime. 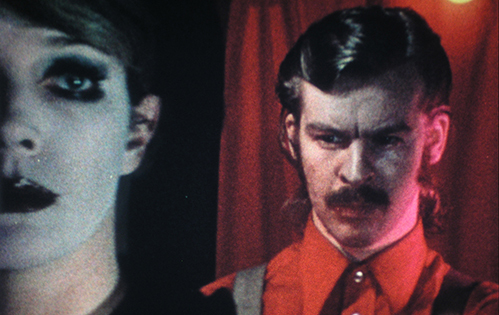 After making his first few shorts in the early 1960s, he was awarded a Fulbright Fellowship for design research in the UK and relocated to London in 1964, where he sought out other filmmakers and quickly established himself as a leading figure in the independent filmmaking community. He co-founded the London Filmmakers’ Co-operative in October 1966, now known as the LUX, and won the Solvay Prize at the 4th International Experimental Film Festival in Belgium for his 1964 films, Naissant and Soliloquy. From the 1970s right up to his death in 2012 he produced a number of avant-garde feature films, including Central Bazaar (1976), The Silent Cry (1977) and Tod und Teufel (1973), establishing himself as someone who approached film with a unique perspective and applied his own distinctive style to his creations. Dwoskin often encouraged those he was filming to engage with the camera, focusing on themes of people, faces, masculinity, sexuality, and disability, among others. The theme of disability, alongside an ongoing examination of the experience of pain and pleasure, was of particular interest to Dwoskin. He had to use crutches, and later, a wheelchair, from the age of nine, after he contracted Polio. Behindert was the first of his films to address his disability directly, examining Dwoskin’s relationship with an able-bodied woman, and later films, such as Intoxicated By My Illness, reflected on a period of his life in intensive care. Despite ongoing periods of poor health, he continued to make films up until he passed away in June 2012, with his final film Age Is… which premiered after his death at the Locarno Film Festival and premiered in the UK at the Tate Modern. The Dwoskin Archive is housed at the University of Reading and contains a wealth of material relating to Dwoskin’s life and work, including working materials, correspondence, unpublished writing and photographs. Dr Rachel Garfield, head of the Art department at the University of Reading, compiled the archive, and it has been deposited at the University by generous consent of the Dwoskin family. A 3 year interdisciplinary AHRC project to preserve and promote the material in the archive, in partnership with the LUX and the BFI, has been awarded funding, with Dr Garfield leading the bid. She will be the principal investigator on the project and it will commence in September 2018, consisting of three strands, involving researchers Jenny Chamarette from Queen Mary University London, Alison Butler from the University of Reading, Yunhyong Kim, University of Glasgow and Frank Hopfgartner from the University of Sheffield. The University of Reading’s Department of Art will also have a full time postdoctoral research associate, Henry Miller, working on the Dwoskin project. One strand of the project will be historic, looking at Dwoskin’s social, political, technological and cultural influences, one will be theoretical, considering his work in relation to new scholarship in gender, disability studies and phenomenology, and one involving digital forensics and data exploration, will make content currently stored on hard drives accessible and draw out new interpretations via multimedia and text analysis. Three artists will also be commissioned to make films addressing the above concerns and all of Dwoskin’s films will be digitised, future proofing them for researchers. Dwoskin’s work plays a crucial role in the history of experimental film and he has had an undeniable influence on other artists, but as yet no analysis has critically assessed his impact, especially with regards to disability, illness, desire and human subjectivity. The aim of the project is to ensure a new generation of filmmakers, artists, and researchers benefit from the legacies of Stephen Dwoskin and his extraordinary catalogue of work. Follow @UniRdg_HCIC and @DwoskinProject on Twitter, and keep an eye on this website for ongoing news updates around this project.